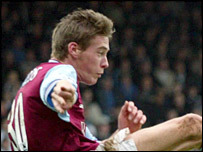 Aston Villa boss David O'Leary has told Wales international Rob Edwards he can leave the club if the price is right. The 21-year-old full-back has had talks with O'Leary since returning from a three-month loan spell at Derby. Edwards said: "I have had a chat with the gaffer and been told that they will let me go for a reasonable fee. "I felt I did okay at Derby and was able to help them avoid relegation. But it does not seem that I have a future at Villa." Villa are believed to want £500,000 for the youngster, who still has a year left on his contract, which could rule out a permanent move to Derby. Edwards added: "I believe there are another couple of clubs interested, one from the Premiership and a big club in the First Division. But I know no more than that. "I am disappointed but really do not know what is going to happen, hopefully it can be sorted out quickly."